Edward Heim Artist Bio Born in Madrid in 1961. Heim was educated in Europe and the United States and currently produces sculpture at his Home studio in Kinnelon, NewJersey. 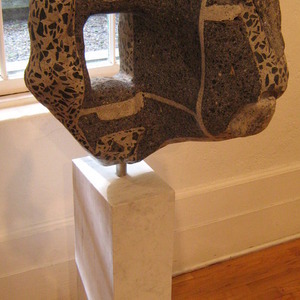 Heim is an award winning sculptor who is an artist member of The Greenwich Art Society, The Greenwich Art Council The Westport Art Center, The Katonah Museum of Art, and The International Center for Sculpture. Heim's work can bee seen in Galleries, Museums, and public and private collection in the U.S. Canada, and Europe. Heim recently produced a series of sculptures in a rare and perhaps new medium by injecting form into discarded concrete, brick, and cinder block. A future exhibit at The Whitney Museum of art is currently under review by the Museum's curatorial department.